Wall covering mimics the artwork on a Susan Goldstick Casablanca bed. I couldn't help getting a little excited as I leafed through the May issue of Elle Decor magazine. Manufactures are displaying some pretty daring ads, crossing new boundaries in design. Just as you see in the world of fashion, the emphasis on bold and colorful prints is huge! No doubt the boho look has taken the home furnishing industry by storm. Be it botanical, graphic or abstract, there's no bias toward a particular color, but more like a new freedom on how it's all put together. It's a risk-taking I haven't seen in years. Furniture, wall coverings, flooring, bedding... every designer is doing an interesting twist with color blocking and pattern. Chairs and sofas are upholstered in multiple fabrics mixing bold splashy prints with solids while intense colors like chartreuse and magenta have a dominance in floor and wall coverings. Of course I'm loving it all. This new trend speaks to the very essence of my design sense touching on passion for color and strategic placement of patterns. Using decorative hardware in an arbitrary fashion just adds to the fun and is a key component in many a Susan Goldstick furniture design where a knob or finial is sure to pop up in the most unusual places. 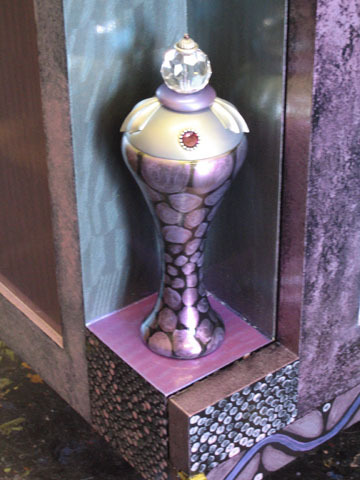 10" Birdie finial stands in the corner of the Ritz media cabinet where multiple paint finishes come together. 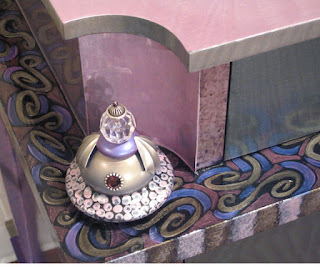 Birdie finial loaded with dots sits in the corner of a Barcelona dresser where the ledge is covered in artful scrolls. Erte Knob sits amidst energetic artwork on a Barcelona bed headboard.. So how do I take my designs a step further and join the momentum that's got the home furnishing industry immersed in this new explosion of color, pattern and design? Let's just say I'm exploring an exaggerated style of decorative hardware that I envision on both cabinetry and furniture. For now I call it the super knob... coming soon. I definitely agree that patterning is crossing over, but it's been around for a while. The key is that the public is finally coming to grips with "different ideas". But I know many an artist who has been attempting to décor differently for some time. (ie, Me & my furniture) whether folks entertain this in their homes is another issue. So many people stick with what's safe - so that keeps the demand slow in coming. Just saying this from my own observation. I sell painted furniture in a small town - and always offer something unique. Just have to wait for the right buyer. I know it's frustrating to have to wait for the major retailers and magazine editors to give the public the "okay" to decorate with pattern and color. I'm not sure it's a movement that will be overwhelming embraced. But for those who love color, it's been a dry spell for the last couple of years and I think Interior designers are going to love the challenge. Hopefully the trend will bring out the right buyer.